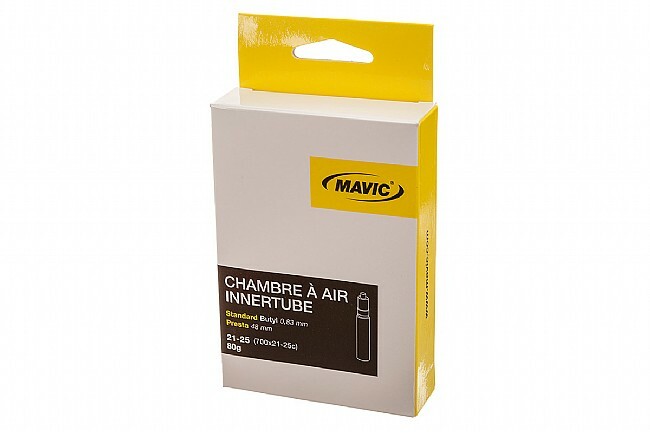 Mavic's Road Tube will take you where you need to go, with high-quality lightweight butyl construction and a cool smooth black valve stem. A 0.83 mm wall thickness keeps this tube light and fast. Fits 700c tires with options for 21-25 mm or 25-32 mm width tires. Each size is also available in your choice of a 48 mm or 60 mm Presta valve. Claimed weight is 81 grams (700c x 21-25 mm). It's a tube that holds air and and the black stem looks cool. The reason for the 5 stars is the black stem looks much better on my Zipp wheels. I rarely get flats. I like these tubes with a smooth valve stem. I use the 80 gram 21-25 with my 25mm Conti 4000 tires on both club and long distance randonneuring rides. Did have 2 flats while using these tubes with Conti Gaterskin tires in Arizona due to thorns during in one week. I use the 125 gram 25-32 with my 32mm Clements only one flat after over 2,500 miles (due to glass shard). Would like a version of this tube for my 36mm Clements which I am using this winter. I like the black valve stem with my Zipp wheels. Tube is not light but very durable. the lighter 80 g version has been sold out for 8 weeks. They look good & perform well. I have put over 2000 miles on one. unfortunately they valve has broken on me twice. I ride everyday so i air up often. If you have a good pump like a Lyzine it's fine. If not they break easily if you wiggle the pump head ever so much. buy a bunch when they restock. These came on my Mavic wheel set and in contrast to all other stems where I always struggle to engagedisengage the pump head these are a breeze to use. No flats with these tubes but when reinstalled on new tire the tube failed at the valve stem. These tubes look great and they have not flatted during rides, but when reused in a new tire two have failed at the valve stem just after installation. The rubber separated from the valve stem. I consider this weak construction. Used in my road wheels. Love the stylish black valve stem and smooth profile. Love the fact that this valve stem is so easy on the pump head and off! The tube is great, but the valve stem is what sets it apart from others. Easy to engage with the pump head, and pops right off once the tube is aired up. No bending or twisting of the stem. No tears at the base. I won't buy any other. I know others don't like these, but for me they have been great over the last five years, and I do not buy anything else. In particular, I like the black look, and the lack of threads, which seem to wear less on my pump inners each time I check the pressure. Have had very few punctures, so would classify as durable - as good as any I have used. Of all the tubes, I have used, I have gotten the most life out of the Mavic tubes. I like the non-threaded valves, easer on the pump head. Good size for rolling up and carrying in the saddle bag. Not the cheapest tubes but you get what you pay for. These came installed on the Mavic Ksyrium EliteS wheelset I purchased over a year ago. The tubes hold pressure longer than others that I've used in the past. I've installed these on all my road bikes and haven't been disappointed. If they make a 26 tube, I'd put them on my 26er build under way. So far so good. I have used these tubes paired with Specialized Armadillo Elite tires all mounted to a Mavic Allroad wheel. This setup is on my commute bike that rolls over a fair amount of puncture worthy material. Anyway, after 2 months of solid 110 miles a week, I've gotten one slow leak. I do like the threadless stem and painted black, its a good clean look. These came with my Mavic Ksyrium Elite S wheels and I noticed that I didn't have to repressure the tires as quickly as with other tubes. I bought another pair of these tubes to replace another brand on another bike and have had the same results. I don't know about flat resistance, but so far, so good. Only tubes I can find with a black smooth valve. Last tubes lasted me about a season - 1,800 miles in summer and winter (Chicago). Both flatted within two weeks of each other during the winter after riding on them all year. Not sure you can expect more than that from a reasonable light weight tube. I run 25mm Vitoria Rubino Pros. My Mavic rims came with this tube initially and I find it looks cool but more importantly seems to be easier on the air chuck from my floor pump without the threaded shaft. One con is that the front rim sometimes has a rattle from the valve stem because it is not retained with the lock nut. Have put a few hundred miles on these tubes so far with Mavic wheels and had no issues. I do like that the stems are black, and the spare seems to fit more comfortably in my jersey pocket. If they ever do go, I definitely plan on sticking with them when I order new ones! Anyway, a good tube, no noise (from the valve stem), no flats so far. I love these tubes. They seem to hold air longer than other butyl tubes, they're light, and the black valve stem looks really cool. I switched from Vittoria's ultra light tubes to these and won't go back.